Since collating a set of contradictory evidence, I finally believe I’ve killed off my 5x Great Grandmother, Elizabeth Wright. Since at least 2011, I’ve been trying on and off to confirm the death of my 5x Great Grandmother Elizabeth Yarrow (née Wright). Elizabeth Wright was born in about 1779, and was baptised at Mepal, a riverside fenland village in Cambridgeshire. She went on to marry farmer William Yarrow in 1800 at his native hamlet Little Thetford – just a few miles south of Ely, again in Cambridgeshire. The couple became parents at least 11 times, with 2 children dying in infancy, and their final child, Susan, in 1821 being noted throughout her life as ‘handicapped’ and ‘suffering from fits’ (which I assume may have been epilepsy, or maybe even asthma). 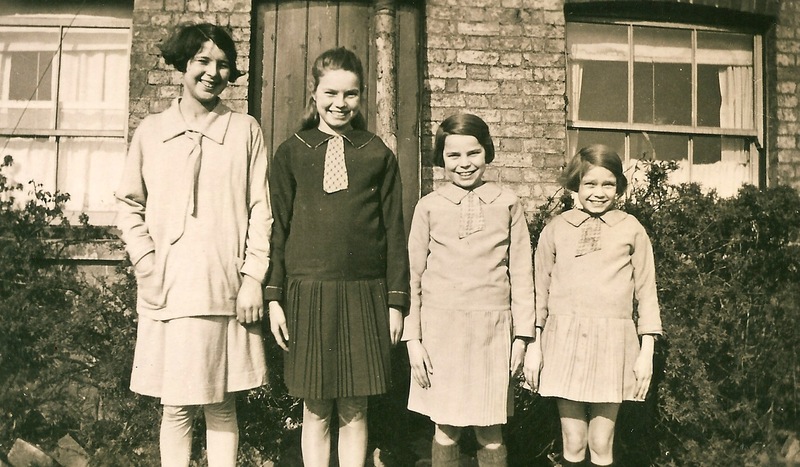 The Yarrow family life would have been hard on the flat bleak unforgiving fenland, but their family grew as their children married, brought grandchildren into the family, and some moved away. My puzzle began with William and Elizabeth’s headstone, which still stands in Stretham churchyard today. 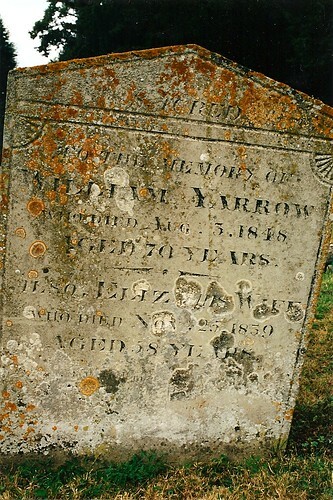 The headstone of William and Elizabeth Yarrow at Stretham. Photo: Andrew Martin, 2010. Close-up of Elizabeth Yarrow’s headstone inscription – that ‘1839’ looks a bit like ‘1859’ but on close inspection, it is definitely a 3. I checked the burial register for around that date. Nothing. No Yarrow burials at Stretham in 1839. The family lived in the nearby hamlet Little Thetford, classed as a ‘parish of’ Stretham, so I checked there too, despite the headstone being in Stretham. So, this solves the lack of note in Stretham’s own register – it was recorded at Little Thetford instead. How can someone be buried 2 days and 2 years before they died? And how did she decrease in age by 8 years? Okay, I can understand that an age might be wrong in a parish register – I’ve seen it so many times in marriage registers, but 2 years out on burial? As a family historian, I can’t resist a puzzle, and so I soon decided to make killing Elizabeth off as one of my New Year Genealogy Resolutions. Little did I realise that she’d take me several years before solving it. Married to William Yarrow at time of death. Buried with him at Stretham, Cambridgeshire. Died some time between late-1837 and late-1839. Spotting the late-1837, I took to FreeBMD, and at this time in 2011, this was THE index I could consult easily. The final quarter of 1837 is the first period in which certification was compulsory, but there was nothing. Maybe it just hadn’t been so widely adopted, or faced opposition? I searched wider, just in case it had been slow to register. There was a result. It was in London too. Elizabeth Yarrow, died in St. Pancras, registered in June Quarter of 1838. I paid my £9.25 and waited a few days, and opened the envelope. It wasn’t her. This Elizabeth Yarrow was just 11 months old, and was the daughter of Charles and Charlotte Elizabeth Yarrow of Tottenham. I then turned to the archive of newspapers that are included in on my FindMyPast membership, but sadly there was nothing there – not for London, nor for Cambridgeshire. It was a long-shot, but I reasoned that maybe her body being brought home by carriage might have got some column inches – a few words to mark her passing – but no. Nothing. I put her to the back of my mind for a while, casually searching the growing newspaper archives now and then, but still seeing nothing of interest. The General Register Office put their birth and death indexes online, and made them wonderfully searchable. Again, I saw the little 11mth old Elizabeth, and that was about it. Earlier this week I decided to do a broader search. I picked 1838, put in her first name, the letter ‘y’ for her surname, chose ‘female’ and allowed a 2 year search range, covering that headstone date. Clicked search and saw a ton of surnames. There were plenty of Yeo deaths and other surnames, and so I began a quick scan down the list. Then I saw an unusual name. 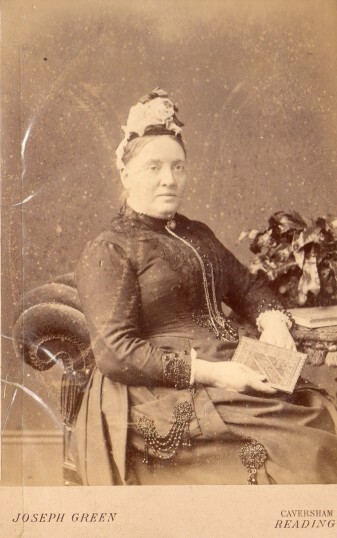 ‘Elizabeth Yerroll’ died in London in the right year, at the right age. But ‘Yerroll’? I’d never heard of that surname before. But then i figured, that if Elizabeth was away from home, then was she alone? Obviously, if my Elizabeth had died, then she could hardly correct someone’s spelling, so anyone who acted as the informant might have been a stranger… or might have reported the death to someone who wasn’t familiar with the Yarrow surname, or wouldn’t have understood the surname being spoken with a potentially fenland accent from her travelling companion. I decided that Yarrow could be Yerroll if you squinted and had waxy ears! Either way, £9.25 made its way to the GRO again, along with an order for another gamble certificate (a blog post for another time), and I waited. 4 days later – today – I received the certificate. I am 99% sure it’s her. Married Woman, Diseased kidneys and bladder, Ann [illegible] 23 Beer Lane, Nurse, Present at death, 28th Nov. I stared at the certificate. Was Elizabeth all alone? Why would she do that? What was she doing in London? It took me a while to see that it read ‘Nurse’ in the informant’s details column, but I don’t recognise the name. It seems that she was taken ill away from home. I wondered where Allhallows Barking was in London, so I looked it up on the map. She died somewhere within earshot of the Tower Of London, right near the River Thames. And there I hit upon the answer after just two or three clicks into my research database. William and Elizabeth Yarrow’s second oldest child was Mary Yarrow. In 1841, Mary was married to an Owen Owen, and they were running an ‘Eating House’. The family held it for many years and it was on Lower Thames Street. The same Lower Thames Street that was now staring back at me while I became misty-eyed about the Tower of London next to it. Elizabeth must have been visiting her daughter at Lower Thames Street, become ill (even though she clearly was quite unwell, perhaps obliviously), and died in the company of a nurse – who didn’t know how to spell her name. Her body would have then been returned home to her family, and buried in Stretham, but recorded in her home hamlet of Little Thetford. This collection of coincidences had grown, and must surely suggest that I’m correct in my assumption. I’m satisfied that I’ve finally killed off my 5x Great Grandmother, and that it’s a Genealogy Resolution that’s now kept, albeit 6 years late. Have you unravelled any puzzles like this? Let me know how you tackled them in the comments below. As ever, thanks for reading, I’m off for a celebratory cuppa. On the second day of the 2014 Who Do You a Think You Are? 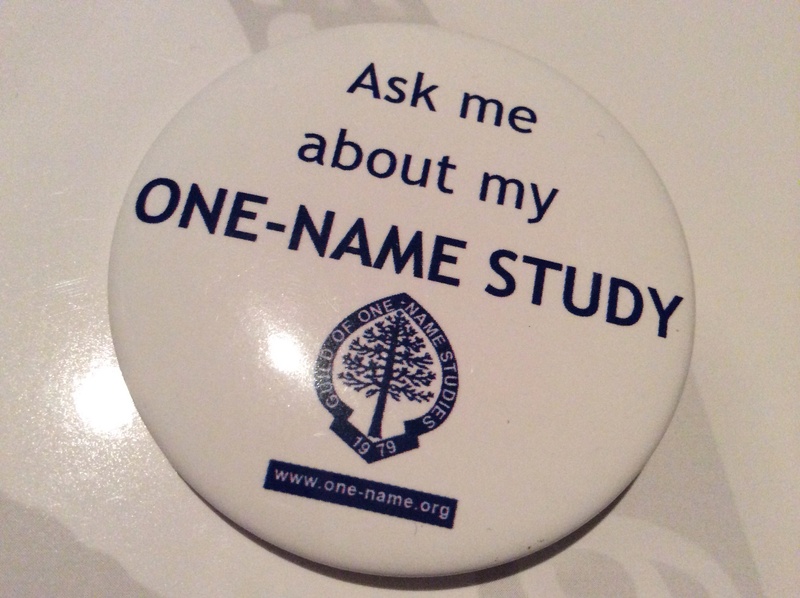 Live show, I joined The Guild of One-Name Studies, and registered the surname of Yarrow. On Day Two of the 2014 Who Do You Think You Are? Live show, I joined the GOONS (the affectionate acronym for The Guild Of One-Name Studies). Not only that, but their Secretary Jan Cooper did such a good job, that I even registered as the worldwide name research point for a surname. I challenged them with three of my more unusual surnames in my ancestry, and they only had one of them (Dewey). I chose to register Yarrow (the other was Moden, and in hindsight, I could probably have tested a few more like Tingey). I’ve been aware of their work (which began in 1979), and have often seen them at talks, but this was the first time I’d actively talked with them. Minutes after becoming their newest recruit, I discovered that I had joined the ranks of a number of genealogy chums who are also fellow GOONS surname registrants. All were hugely positive of the Guild, and of the supportive approach between members, and registrants. Armed with the induction pack and a detailed guide titled ‘Seven Pillars of Wisdom‘, I shall endeavour to record and data crunch all Yarrow name-bearers that I can find, or that find me. I shall be absorbing the guide over the next week, and start my data trawling. In the meantime, if you’re a Yarrow, have Yarrow ancestors or relatives, or have information about Yarrow surname bearers, then I’d like to hear from you (feel free to leave comments below). I’ve just set up @YarrowGOONS on Twitter, to help me reach out and connect with the surname connection. 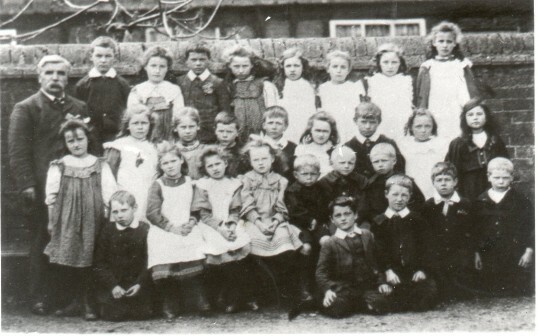 Memories of attending Wilburton Primary School, Cambridgeshire, during the Edwardian era, including snowstorms and earthworms. I started school when I was 5 years old . 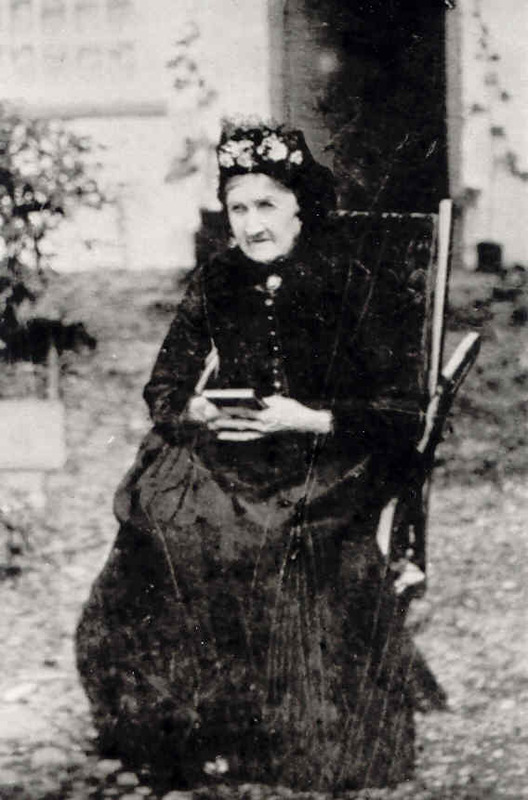 My mother [Adelaide (née Bishop)] was very good, she used to show us how to write, count and read as she taught the infants at Little Thetford school. Our school [Wilburton Primary] consisted of two rooms – a big one divided by a wooden and glass partition which was pulled across. Mrs Alma Marchant with children from Wilburton Primary School. Maude is apparently 5ft from left, on the third row. Image: CCAN. There were over 100 of us with two teachers, Mr Harry Marchant and his wife Alma, who lived in the school house. The school was built on the back of their house. Strict or soft? Alma A. Marchant mistress at Wilburton School. Image: CCAN. The girls and infants had to go in the front way. We had a small playground and the laboratories were in a block across there with the fuel shed. We only had a small porch for hanging our coats and bags in, so they had to hang over one another which wasn’t very well on wet days. We had a basket behind the door with a tin bowl on it where we used to wash in and a roller-towel on the door. We used to have to pump water to wash in but we were not allowed to drink the water as we used to pump earthworms up sometimes and our teachers had to fetch their drinking water from another house. We used to take food with us for midday and go out begging for water to drink. There were quite a lot of us dinner children, as the came from far away places. Mother always cooked us some hot dinner when it was cold. We lived a long way from school. I remembered my next sister, Jessie and I got lost in a snow storm. We had to walk down a long path. It was dark and snowing hard and the school master had kept us in until 4pm. The big children ran home without us, so mother ran to the station and told father (the stationmaster) and he had to run up the path looking for us in between train arrivals. We were lost and it was snowing hard and we did not know which way to go. We were heading the wrong way – back to Wilburton. Jessie was five and I was six. I think poor old dad didn’t get and tea that night. He used to have to get his meals when he could and if he had to put overtime in when trains were late he had to lay off the next day to make it up. During dinner times we played with skipping ropes, hoops, tops, marbles and balls. We sat in school at long desks attached and tightly pushed together and it was very cold for those at the back as the stoves didn’t send much heat back there. Father sent a letter to the school master the day after we got lost, and gave him a good telling off! It was too dark to do lessons, so why didn’t he keep us in? After that, Mr Marchant let all the long-distance children go home sooner when it was dark early. 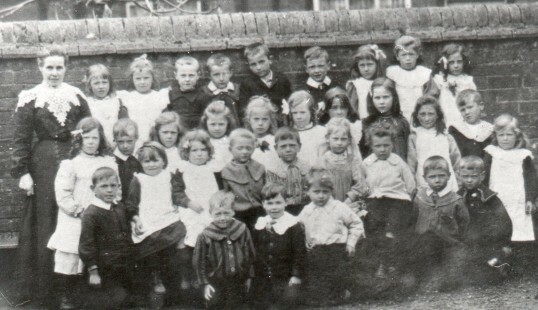 Schoolmaster Mr Harry Marchant, with children at the Wilburton Primary School. Image: CCAN. We were very poor as he only brought home about 15 shillings and 10 pence after he had paid house rent and club money. Father was a good gardener and he grew us plenty of vegetables. He kept bees so that we got some honey and mother made a lot of jam. We used to do sewing and knitting at night when we had washed up. Mother was good at that and she used to put us right and we used to teach other dinner children. We used to pull old socks undone to do it and children from farms brought fencing nails as needles. We used to have some happy times, and we used to play in the road. I passed an exam when I was twelve and had to go and work in the fruit gardens to earn a few more shillings but the poor Dr. Banardos children were sent to Canada and Australia to work when they were twelve. It did seem a shame and we didn’t see them again, poor little things. The people who had them were very upset over that as some of them had had them from babies. 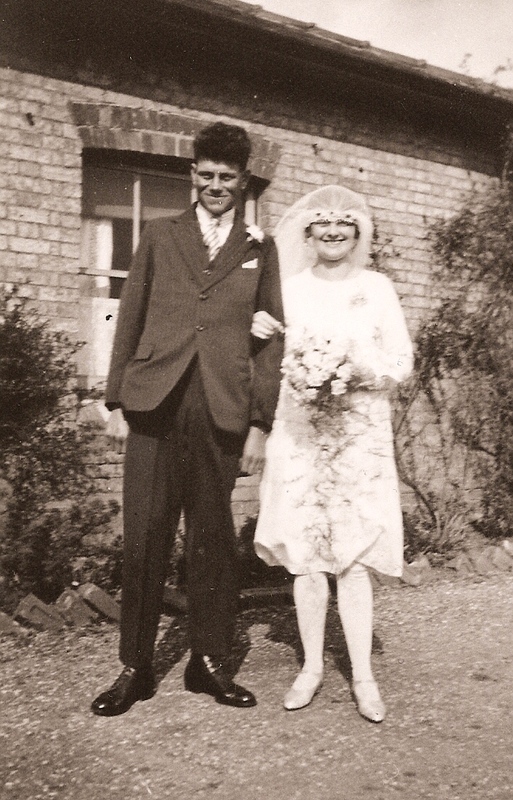 This week, we’re off to 1929 for Wedding Wednesday – to my great grandparents’ wedding at Wilburton, Cambridgeshire. In this week’s Wedding Wednesday blog post, it’s the turn of my Great Grandparents, who married on All Fool’s Day in 1929. Here’s the happy couple, standing outside my great grandmother’s parents’ house at Wilburton, Cambridgeshire. Ernest and Maude – married on 1st April 1929. 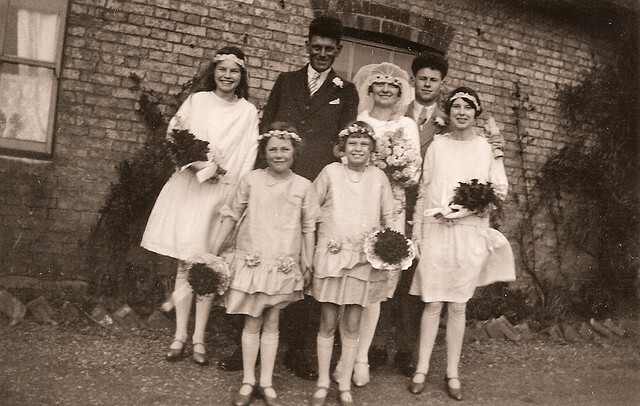 Here’s the happy couple again, this time with their wedding group – the groom’s half-brother Walter ‘Curly’ Hopkin, and the bride’s younger sisters. One of the bridesmaids is still alive, and has just turned 102 years old. My Great Grandmother (the bride), her sister, reached 104. Ernest and Maude enjoyed 56 years of marriage, until Ernest’s death in 1985. My top 5 genealogy things I hope to achieve in 2013 – a mixture of visits, writing and demolishing those research brick walls. I don’t really go for New Year’s Resolutions, as I like to challenge myself on a daily basis, but I thought that I would put down 5 areas of my family tree research where I hope to make progress in 2013. If you use RootsChat.com, you may have spotted me trying to unravel the Bowers family of Burwell, Cambridgeshire. There’s quite a lot of them there during the 19th century, and amongst them i am sure, *should be* my Great Great Great Great Grandfather, Henry Bowers – yet there’s no sign of him in an appropriate part of the baptism registers, and unhelpfully he was born in about 1812 (so, well before that helpful 1st July 1837 date) and there’s no parents noted on his 1832 marriage entry in nearby Wicken. Henry’s children’s Burwell connections are frequent, yet he himself has yet to appear. I feel that I’m beginning to make progress though, by researching all the Bowers in Burwell by cross-referencing the registers to census returns. Annoyingly, my favourite census – the 1851 for Burwell – is missing, and so this leaves a hole in the data. I am determined to crack this one. Somehow. Elizabeth Yarrow‘s birth, death and burial dates and place of death is open to discussion as none of the key sources corroborate. A death in London, a burial in Stretham, a date of burial in Stretham differing from the date of burial (randomly) noted in the register for neighbouring hamlet Little Thetford, date of death and age different between burial registers and gravestone. It’s all a mess… and with her 1837 death year, there’s also no suitable certificate to help iron it all out (the one i did excitedly find was for a small child). My 5x Great Grandmother’s life and death might be impossible to unravel unless I get my hands on some newspapers and some railway records. So, for quite a while now I’ve been toying with writing up research into a book, but then the genealogist’s work is never ever finished – so at what point do I start and end the book? What do i include and omit? Having several friends who are published authors themselves helps, but I hope to be able to work out how, and start, to turn my years of research into something that can be shared in print and in eBook. If you’re a published genealogy author – drop me a message – i’d love to hear about your experiences. I’m quite good at this, mainly because few strayed from Cambridgeshire. Top of my list is to find the building (or site) of my Great Grandmother’s birthplace – The Stables, Abercorn Place, Kilburn. I’ve meandered the streets via Google Streetview, and I’ve been in the neighbouring streets (including the famous Abbey Road) where the family lived and worked… but this place remains unvisited. My Great x4 Grandmother, Mary Clarke ended up in court and eventually prison for neglecting, abusing and playing the role of wicked step-mother to her husband’s children during the mid-1800s. She’d already bore my Great x3 Grandmother and a brother outside of marriage and before becoming the wife of William Bailey of Botesdale, Suffolk. This was to be to their advantage, as they went on to escape the miserable family life that followed. No wonder my Great x3 Grandmother Caroline Clarke changed her name and hid her parentage. Meanwhile, after a couple of stints in the workhouse, and one in prison, Mary vanishes after 1881… but I’ve yet to kill her off. Mary, i’m coming to get you! What genealogy brick walls are you hoping to demolish in 2013? Is there something special you hope to achieve in the coming year? Let me know in the comments below. Alternatively, join in the conversation over on LinkedIn. The story of Thomas Yarrow (1832-1914) who went from being a Beer Seller in a small Cambridgeshire village, to being a Sergeant in the Indian Mutiny, and then into poverty in London. A long-standing puzzle quickly and suddenly unravels to reveal a story of a beer seller from a Cambridgeshire village, who became a Sergeant for his role in the Indian Mutiny. Thomas Yarrow, born circa 1832, was the youngest of the two children of John Yarrow, a farmer of Little Thetford, Cambridgeshire, and his first wife Ann Whiten. His older brother Owen, was born just two years earlier. Little Thetford in 1906. The Three Horseshoes on the left, and the Yarrow home in the foreground (right) until it burnt down in 1930. When Thomas was about 11 years old, his mother Ann died in 1843 at the age of 34 years old. This left her widower John with two growing boys to care for. It was a little over a year later that John re-married to Miss Elizabeth Jeffery of Ely and the couple soon found that they had a baby on the way. Together John and Elizabeth had four children – James, William, Albert and Maria, until John died in 1858 at the age of 52. By this time, the 1851 census had already shown the Yarrow family holding a number of business in the village, and the family are shown as living at ‘The Wheat Sheaf’ – long since closed. It was here that a 19 year old Thomas Yarrow, beer retailer, was to make what seemed like his final census appearance. By the time of the 1861 census, there’s no sign of Thomas, yet his siblings including his older brother Owen could all be found. All of the usual alternative spellings revealed no trace of him in the census, leaving me to assume that he’d either died, or that he’d moved to Ely where a data black-hole was hiding him (the 1861 census for Ely was destroyed in flooding and therefore leaves a hole in most of my family branches). I checked the 1871 census, in case he had been missed or had indeed been ‘hiding’ in Ely, but there was no sign of him. So then I checked for a death and found one in 1853 in the right district. Ordering the certificate, it arrived a few days later…. Rather than seeing a 20-something Thomas Yarrow, it was a certificate for a 3 day old premature baby Thomas Yarrow from a nearby village. With Thomas not indexed as dying, and not appearing on the 1871 census it led me to start thinking that maybe he had gone overseas. A quick check on familysearch.org soon found some records that seemed to match, spanning 1867 to 1874 (an explanation why he didn’t appear on the 1871 UK census) and that’s when I noticed the mention of Allahabad. This came as a surprise as the rest of the Yarrow had stayed local to Little Thetford or at least within the UK. After a few more searches, I found that Thomas was married with at least four children. This was swiftly backed up by the Families In British India Society (FIBIS) who had online records of Thomas and his marriage to Catherine O’Keefe (née Lambert) in Bengal. Above: Thomas Yarrow (2nd from left) with his wife Catherine (4th from left). 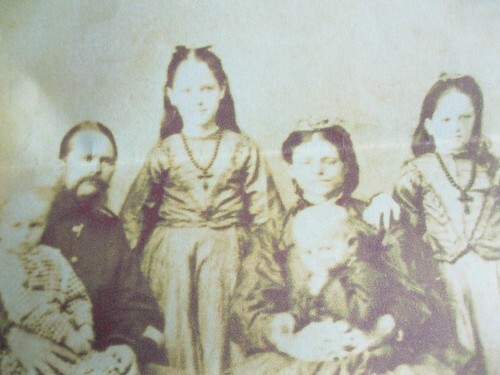 Catherine's daughter from her first marriage stands between them, third from left. 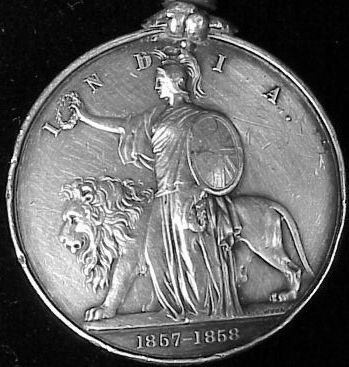 The FIBIS site also revealed that Thomas was part of the 35th Foot (Royal Sussex) regiment and was made a Sergeant during the 1857-1859 campaign, and received The Indian Mutiny Medal. I soon located discharge papers dated from 10th March 1875 where it describes Thomas’ conduct. The papers also describe Thomas as being just 5ft 7″ tall, with a dark complexion, grey eyes, dark hair and fit. The documents also state that he would return to Little Thetford to work as a Labourer. By the time of the UK 1881 census, Thomas and the surviving children of his family have returned to England. A daughter, Frances Maud Yarrow, is listed in 1881 as having been born in 1877, in the village Little Downham, Cambridgeshire. However, at the time of this 1881 census, the family have moved to number 6 Georgina Gardens, Columbia Road, Hackney, London. The youngest child of the family, John, was born in 1879 in Bethnal Green. Leopold Buildings in 2007 where Thomas lived in 1891 was built on land leased by 'Queen of the Poor' Angela Burdett-Coutts. By the time of the 1891 census, Thomas is living alone with his youngest son John. Catherine had died and they are living in Leopold Buildings – a block of densely populated tenement flats built by The Improved Industrial Dwellings Company on land leased by the wealthy ‘Queen of the Poor’ Angela Burdett-Coutts . Just 20 years earlier, Bethnal Green was the poorest parish in the whole of London – conditions must have been harsh. Thomas remarried by 1901 to a woman called Edith Emily Rawlings, who was much younger than himself, and they appear in 1901 in Soho, London. Thomas also outlived his second wife, and appears to have ended his days in 1914 at about 82 years, living in Forton, Gosport, Hampshire. Whilst Thomas’ children seem to vanish, just as he had in 1861, it’s only his youngest son John (pictured right) who seems to stick around, appearing in Portland, Dorset as an attendant at a Special Naval Hospital, Castletown. The Little Thetford Yarrow family are not known to have made contact with Thomas after his departure to the Indian Mutiny. Whether there was a feud, or they didn’t agree with his choice of army career, or simply just lost contact – it will remain lost in time. There was certainly no reference made to his existence by his siblings’ descendants. Surely a story of a sergeant in the family and the battles he fought in would have been handed down, regardless of how people felt towards it? Mourning the death of her husband James Yarrow, Mary (née Gothard) loses her thatched cottage on Guy Fawkes Night when a stray firework burns it to the ground. Just 3 months later, she too passes away. Whilst Guy Fawkes Night is marked this weekend with bonfires and fireworks, the night was one far from celebration in the small village of Little Thetford, near Ely, Cambridgeshire. 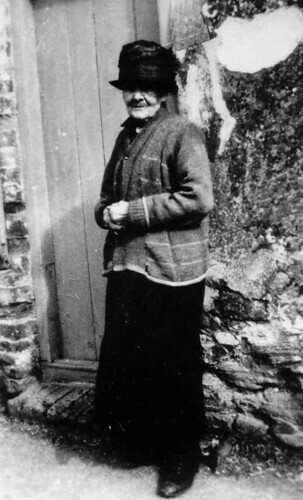 On about the 28th October 1930, my Great Great Great Grandfather, James Yarrow died aged 84yrs. He was buried in Little Thetford on 30th. His widow, Mary (née Gothard), aged about 83-84yrs survived him. 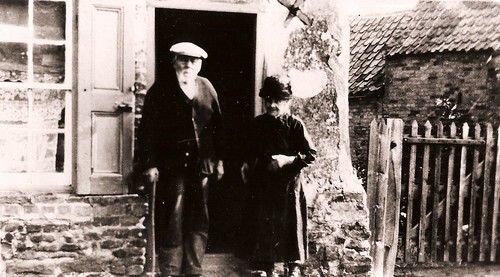 James and Mary Yarrow outside their house in Little Thetford, pre-late October 1930. With the memory of her husband’s death still fresh in her mind, Mary went to stay with her middle son (my Great Great Grandfather) James Yarrow at nearby Wilburton Station. However, six days after James’ funeral, and on Guy Fawkes Night (5th November), a stray firework landed on the thatched roof of her home. The building was razed to the ground. “… The cottage was the property of Mrs. Lister, and had been in the occupation of the Yarrow family for many years. It was the one in which Mr James Yarrow, whose death was recorded in our last issue, died only a week and two days previously, and the advanced age of 84 years. The outbreak of fire was first noticed about 8:30pm, but the Ely Fire Brigade was not summoned until 9:35. They responded to the call in their usual speedy manner, and were on the scene of the fire by 9:50. Meanwhile, Mr. H. E. Kisby and a number of willing helpers had been working heroically in an endeavour to keep the fire subdued. They experienced some difficulty in preventing the flames from spreading to a house standing opposite in the occupation of Mr. F. O. Yarrow. Fortunately they were able to save all the furniture inside the burning cottage, which was not occupied at the time. 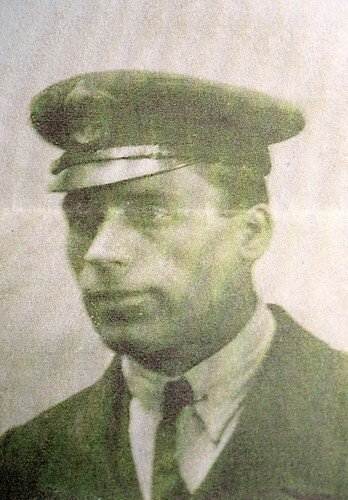 The widow of the late Mr. James Yarrow was living with her son at Wilburton Station. When the Brigade arrived under the charge of Lieut-Col. G. L. Archer, they endeavoured to get water from a nearby pond, but this was found to be unsuitable and they had to move the engine to a drain some 500 or 600 yards from the scene of the fire. The supply of water from this was not very good, and the brigade had to use several lengths of hose. They were unable to put out the flames and the old cottage gradually burnt itself out”. It was fortunate that Mary was away, and extremely fortunate that her neighbours had rallied around to rescue as many of her possessions as they could. Mary outside her house before the fire. The effects of this double tragedy are recounted in Mary’s obituary on page 15 of The Cambridgeshire Times of the 27th February 1931 – just 3 months after the fire. I’m very fortunate to have located 2, possibly 3 photos of James and Mary – which may have even survived only because of the bravery of those villagers who entered her burning property and retrieved her belongings. So, whatever you do this Guy Fawkes Night, please stay safe and act responsibly when near to bonfires and fireworks. Here’s some safety tips from BBC’s Newsround. Killing off your relatives is a crucial part of your work…. as a genealogist, not as a marauding tyrant. I’m hoping that aside from in genealogy, that there’s nowhere else where the mark of a successful day is one where you’ve killed off a load of your relatives. Anyone tracing their family tree is sure to stumbled across at least one elusive relative at some point in their research. That relative will cause them to spend many hours following potential leads and plenty of head scratching and brow creasing before either solving or putting it off until a rainier day. This is a routine I know well. Elizabeth Yarrow (née Wright) seems to have died and been buried more than once. I’ve recently struggled to kill off a maternal 4x Great Grandmother called Elizabeth Yarrow (née Wright), who appears to have died twice (about 2yrs apart) and been buried – in neighbouring parishes (!). Her death(s) fall right at the start of Death Certification in England and Wales. One of them is even noted as being in London and that her body was carried back on the train. However, there’s seemingly no death certificate for her (the only one that matched in name turned out to be a baby), and parish records and the gravestone all contradict eachother. I’m currently struggling to find a my paternal Gtx4 Grandparents John Levitt with Elizabeth (née Skeel), and one of their sons Richard Skeel Levitt, during the 1871 census. I can find the rest of their children, but for some reason in 1871 they vanish. I have them living in the same parish in all the censuses before and after this particular one. So, did they elude the enumerator? Were they away somewhere? – and if so, why don’t they appear somewhere else? The surname has many variants but having done some pretty vague searches and very specific ones too, they remain elusive. Richard never married and seems to stick with his parents until their death, after which he goes to live with his other unmarried brother. It’s odd that all three seem to be missing. Okay, to be fair, three marriages is probably nothing compared to some, but Mary Tingey surprised me. Born in 1820, she married to John Crisp in 1846. He died soon after their son was born. Within 4 years she had remarried to widower James Martin (my Gtx3 Grandfather) in 1850 and the following year they started their own family. After 5 children – with seemingly just one surviving (my ancestor) tuberculosis and scarlet fever, and then the tragic train accident that claimed her husband, Mary lived alone as a widow. I’d hunted for her death for some time, but the searches were unsuccessful. I hadn’t considered that instead of being buried somewhere out of step with the rest of her family or that she had been recorded for some reason under an earlier name, that she had remarried. One evening I stumbled across the marriage in 1877 with 57yr old widow Mary Martin, formerly Crisp (née Tingey) becoming the second Mrs Matthew Watlington. To add to the confusion, the new surname occasionally appears as Watling. These are just three of several situations where I’ve struggled to solve a puzzle. Whilst I know that checking and cross-checking is absolutely crucial to accurately recording your genealogy, it can be all too easy to accept even documentation and gravestones of the time as being accurate. I’d like to say that I’ve learnt my lesson the hard way… but I say that every time it happens.